Some of the biggest, most profitable trading opportunities only come around once every thirty years or so and we think this may be one of them. Why do we think we have spotted a massive trading opportunity? We believe a thirty three year overhead resistance level may be broken in the near future and the big money is made in the big trends. We believe a precedent for this breakout has already been set. We believe there may be an early “buy signal” in the current setup. 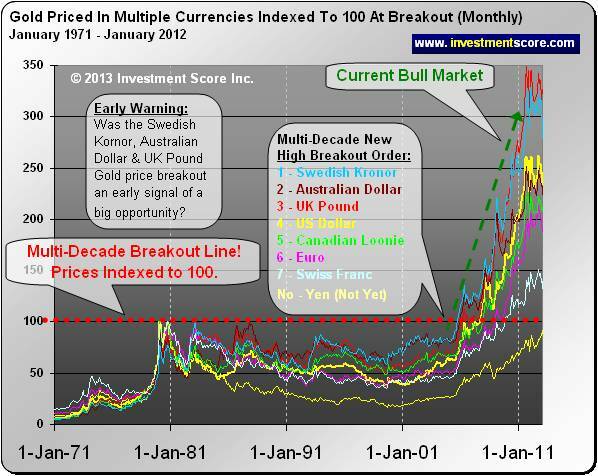 A twenty five plus year resistance line is broken by the price of gold in seven out of the eight currencies. The price tends to explode higher once the long term, twenty five plus year resistance level was broken. Not all of the indexes broke out at the same point in time. A few currencies broke through their long term resistance levels earlier than the others including the price of gold in US dollars. These early breaks turned out to be an early warning signal that the price of gold in most currencies were about to follow. Each index breaking its long term trend at a different point in time. Gold priced in the Swedish Kroner breaking out almost two years prior to the Gold/USD. Was the early breakout a signal of what was to come? 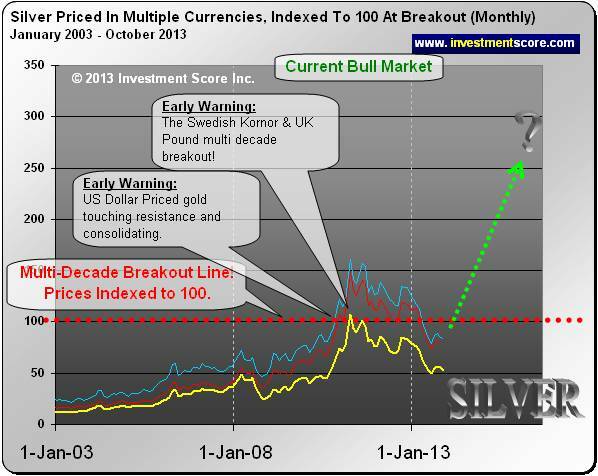 There is long term resistance ahead of the price of silver except the silver resistance time period is even longer. This may be even more bullish. The Swedish Kroner and UK Pound indexes have broken resistance ahead of the US index. The metal priced in US dollars touched resistance and consolidated. 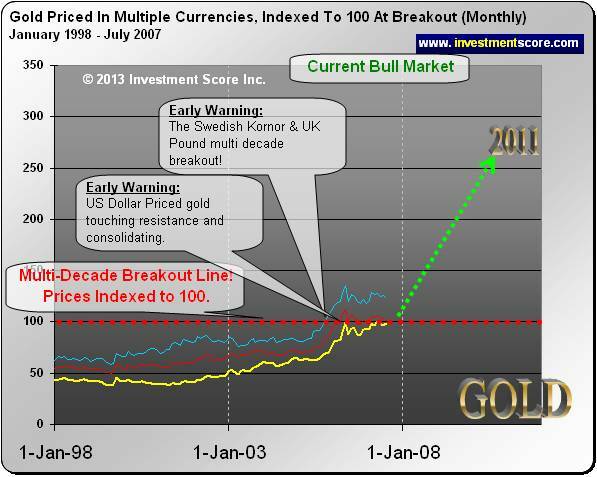 Both metals have been in a major bull market since the early 2000’s. Note the similarities between the silver chart above and the setup in gold which resulted in a huge price advance (chart below). 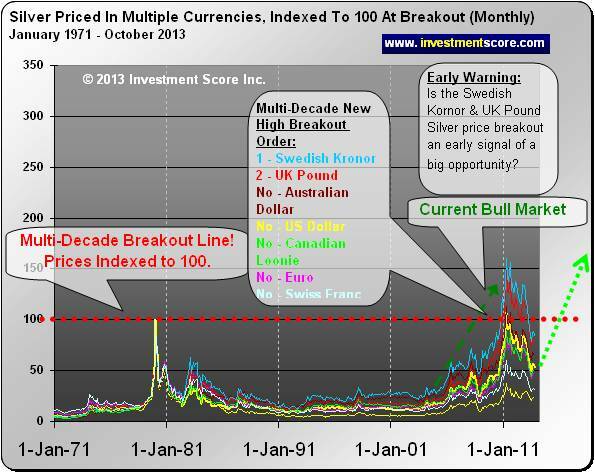 In these charts we can clearly see the metal’s priced in two currencies breaking long term resistance in advance of the US dollar price. Then the metals priced in US dollars hit the long term resistance and bounce off. 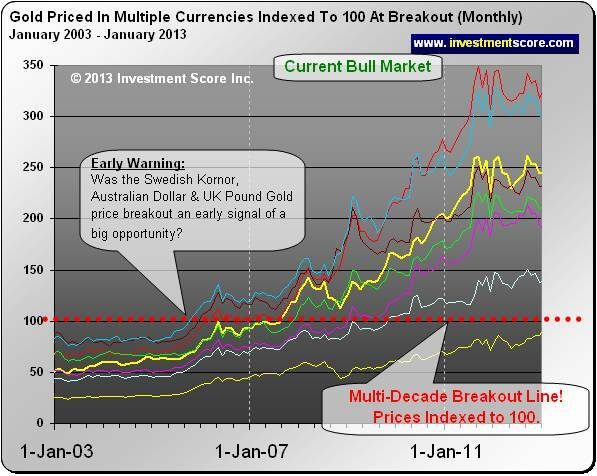 Eventually the US dollar price of gold follows the others to significantly higher levels. 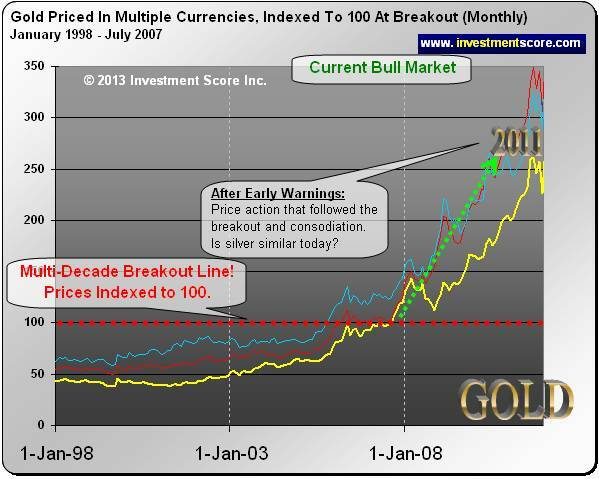 In our opinion the silver and gold bull market is alive and well, and silver may be in for an explosion in the coming months / years. If the price of silver were to follow the setup in gold we would see silver rocket well past $50 an ounce.